Tracks fishery stocks: The RI Department of Environmental Management trawl survey supports local and regional fisheries stock assessments by tracking the relative abundance of finfish and shellfish assemblages in Narragansett Bay, and Rhode Island and Block Island Sounds. These data provide stock and recruitment information on key commercial and recreational species to help inform fishery management decisions based on stock size. Monitors response to environmental change: The survey also tracks changes in fishery dynamics as they relate to environmental changes. These data can help explain variations in fish stocks, which may help to improve our understanding of why fish populations vary between different locations over time. Recreational fishing is a favored pastime of many Rhode Islanders, and a significant economic driver for the state. Photo courtesy of the Coastal Institute. Rhode Island’s coastal fisheries are a large contributor to our state’s economy and culture through both commercial and recreational fisheries as well as associated businesses such as bait shops, sporting goods stores, marinas, and seafood sales. In 2015, total commercial finfish landings — which exclude shellfish and lobsters — were valued at $47 million, with squid and flounder being two of the most important species. 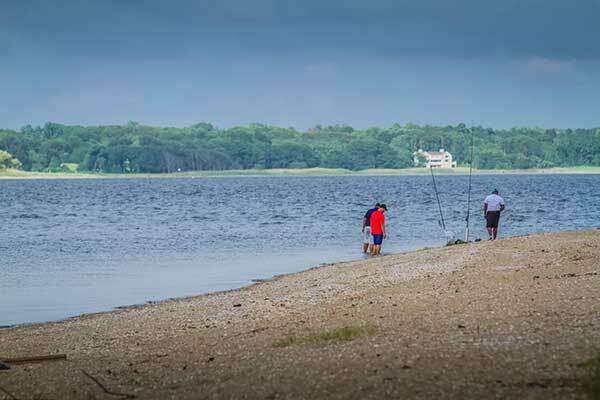 Recreational fishing is also important, with approximately 80,000 Rhode Islanders participating in recreational saltwater fishing with an equally robust number of out-of-staters coming here to fish. The total impact of recreational saltwater fishing has been valued at nearly $160 million per year, including things like money spent on hotel accommodations and eating out in restaurants by our non-Rhode Island guests. The economic impact of business associated with the fishing industry is a bit harder to get a handle on, but, as an example, over 10,000 Rhode Island jobs are supported by the seafood industry. In addition to the more obvious benefits of commercially valuable and recreationally sought-after species like stripper, other fish are just as important. Some fish species are relied upon as delectable bait to catch “the big one” while others are key to the functioning of the ecosystem as a whole by serving as food for larger fish or birds. 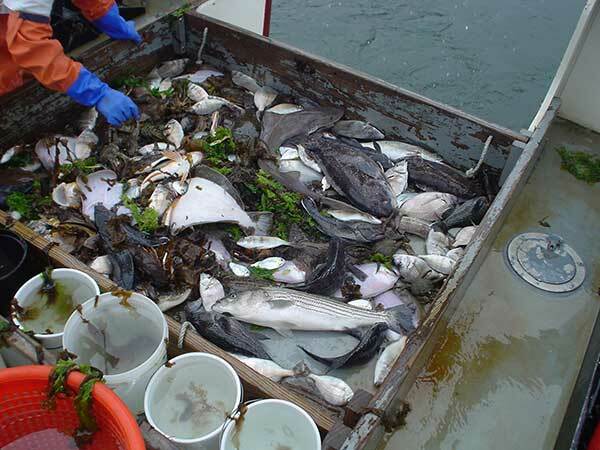 Coastal fisheries are monitored through trawl surveys such as this typical haul full of cod, skate and dogfish. Photo courtesy of RIDEM Marine Fisheries Section. Coastal ecosystems are complex with a variety of factors impacting fish abundance and their preferred habitat: water quality, food sources, competitors, predators, habitat availability , and dissolved oxygen stability, to name just a few. Some coastal fish populations — such as eels and river herring — are affected by factors in both marine and freshwater areas, as their life cycle depends on both of these habitats. And, underlying all of these factors is climate change, particularly warming waters that result in a northward migration of cold-water species. The Rhode Island Department of Environmental Management (RIDEM) takes this interconnected system into account when managing Rhode Island’s fisheries. RIDEM is continuously updating its policies to incorporate new scientific information on the status of species populations by working with fishers, regional/federal agencies, and other groups that have authority over and knowledge of fishing. Coastal Fishery Trawl Survey data are vital to assessing the health and status of marine fisheries resources and their habitats in Rhode Island. These data allow managers to assess the performance and effectiveness of management strategies for economically and ecologically important species, and indicate when different techniques or management actions should be implemented. These trawl surveys have become even more important as researchers and regulators seek to understand the impact of climate change on different species and how changes in population size and distribution may have cascading economic impacts on the fishing industry, tourism, and coastal communities. 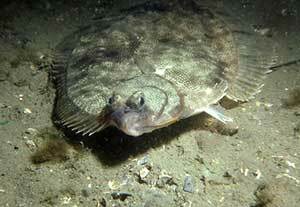 This winter flounder is an example of a demersal fish species. Photo Courtesy of Jerry Prezioso, NEFSC/NOAA. Demersal fish: The demersal zone is defined as the bottom layers of the bay or ocean including the water column near the seafloor, and demersal fish are those that primarily live and feed in this zone. Examples include flounder, cod, hake and seabass. Pelagic fish: The pelagic zone is defined as the open water of the bay or ocean including the water column that does not include the bottom and does not connect to land, and pelagic fish are those species that inhabit this zone. Examples include herring, sardines, menhaden, swordfish, and tuna. Diadromous fish: Diadromous fish migrate between the salty ocean waters and fresh inland rivers and streams. Anadromous fish spawn (deposit eggs) in freshwater and then migrate to the ocean, returning to fresh water annually to lay eggs. Anadromous species include salmon and herring. Catadromous fish exhibit the reverse life history, living in freshwater and returning to the ocean waters to spawn. Catadromous fish include American eels.